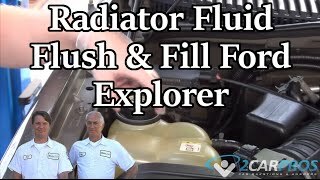 The coolant reservoir is used to contain the heated and expanding coolant forced out of the radiator when the engine heats up. This is a natural occurrence, when any liquid is heated it expands. 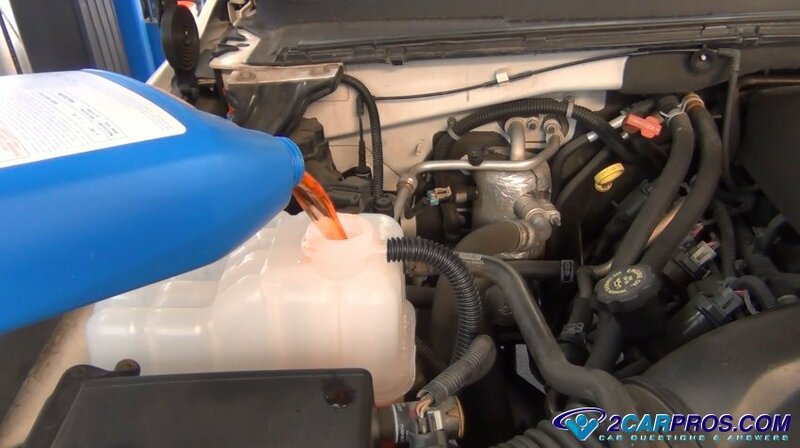 Because the cooling system works best when there are no air bubbles in it a coolant reservoir is used to catch the heated coolant and then allow the coolant it to be pulled back into the radiator once the engine has cooled down. 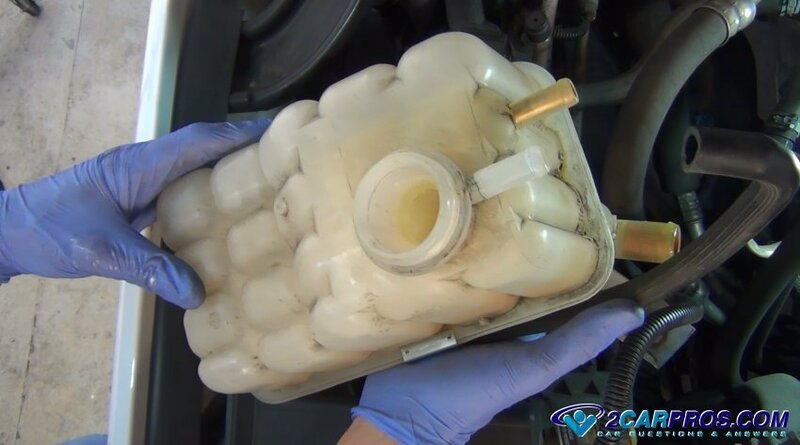 The coolant reservoir is made of plastic and with the extreme temperature changes it will become brittle and leak coolant or the mounting tabs will break off allowing the reservoir to move round in the engine compartment. In either case the unit must be replaced to retain it's proper operation. When having the job done at a dealership or a repair garage it will cost between $90.00 (US) and $130.00 (US) depending on reservoir's location and manufacturer. If you are doing the job yourself you can get the part from Amazon for between $5.00 and $45.00 (US). 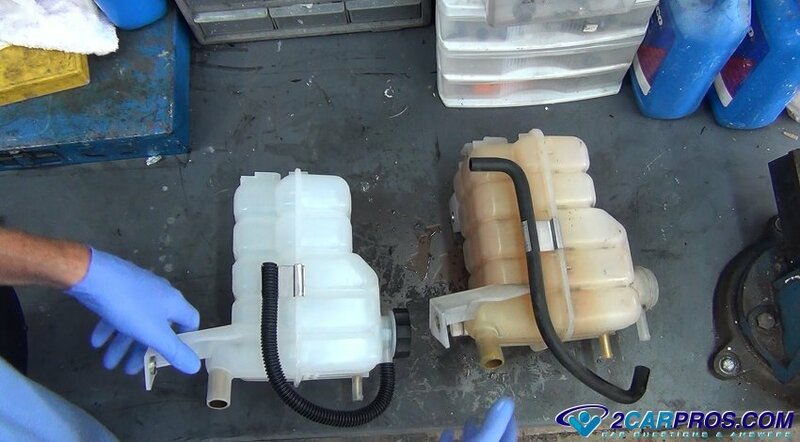 You will need a bit of coolant to refill the reservoir and the cooling system once the installing is complete. 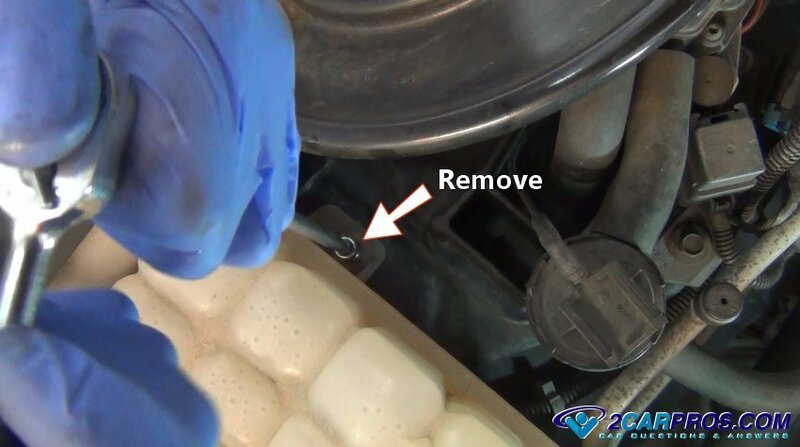 In most cases you will be able to change the reservoir using everyday tools while the car is on the ground. But sometimes the car will need to be lifted to get at that pesky underneath screw in which case the car will need to be raised using a floor jack and supported on jack stands. 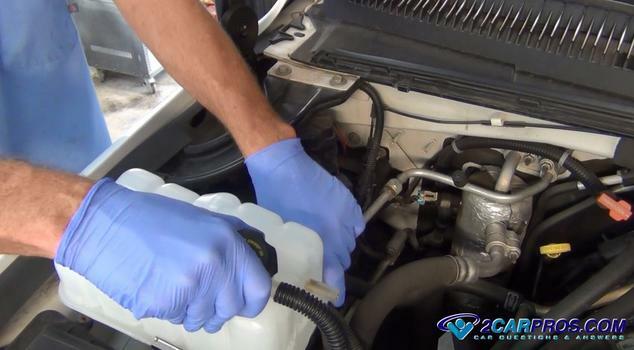 You will also want to use gloves to protect against cuts and the grime of the engine compartment. If the reservoir is pressurized with a screw on cap you should drain the cooling system before beginning this job. There will be a video of a coolant reservoir replacement at the bottom of this guide. Remove the reservoir cap and place it to the side. At the top of the coolant reservoir there will be an overflow hose which is designed to relieve the coolant once it has reached the top of the container. Using a pair of pliers gently force the tube from the fitting. On some coolant reservoirs there will be a small upper pressure hose designed to transfer air out of the radiator and into the upper portion of the reservoir. Using a clamp removal tool or pliers remove the upper hose. 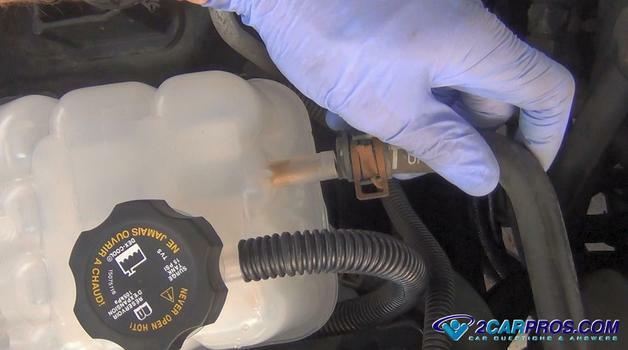 There will be a lower coolant hose which is designed to transfer coolant into the radiator. It too will need to be removed by using a hose clamp removal tool. 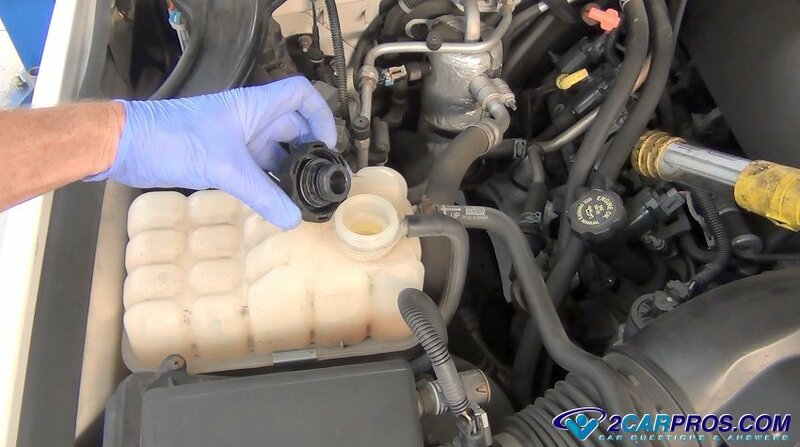 There may be a small amount of coolant that will drip from the fitting once the hose has been removed. 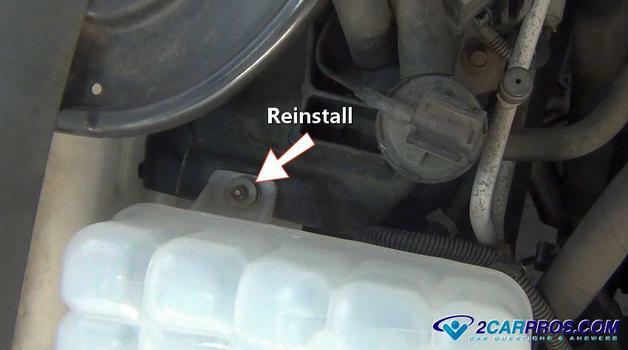 There should be two to three mounting bolts or screws holding the coolant reservoir in place. Locate these screws or bolts and remove them using a small socket or screwdriver and turning them counterclockwise. Some mounting bolts could be under the car or in the fender well. On some coolant reservoirs there may be an electrical connector to monitor the coolant level. Push the safety clip outward to separate the connector from the sensor. These can be a little stuck due to the weather pack seal which is designed to keep moisture away from the terminals and prevent corrosion. Now the coolant reservoir will be loose in the engine compartment. 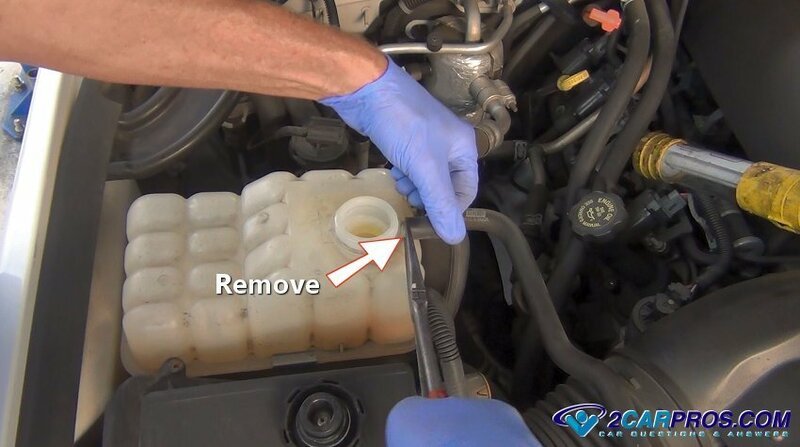 Grasp the container and maneuver it from the engine compartment. Residual coolant may dribble out of the reservoir so use caution. Remove the new coolant reservoir from the box and lay it next to the old unit. Observe the hose connection, mounting tabs and electrical connectors to make sure they or present and in the same locations. Some reservoirs include a new pressure cap like the one in this example. The overflow tube configuration is a little bit different in the replacement unit but will still work as intended. 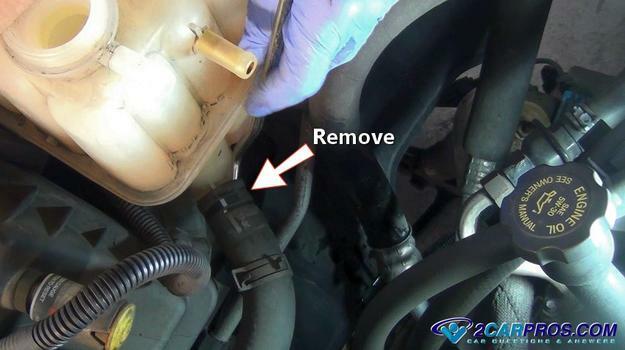 Before lowering the reservoir into the engine compartment be sure to reconnect the electrical connector. This will avoid having to try and attach the connector once the installation is complete which will be more difficult. Gently lower the new unit into place while maneuvering it into the mounting pins or lining up the screw or bolt holes. Reinstall all of the mounting bolts and screws by hand and then tighten them evenly one at a time. 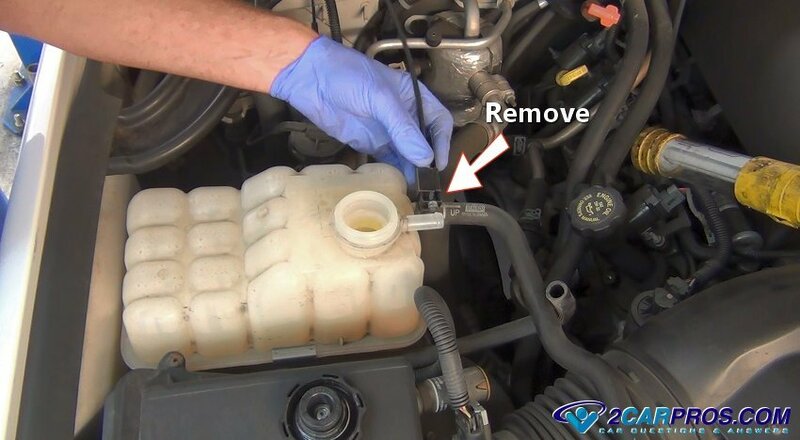 Start with the lower coolant hoses and then finish reconnecting the upper hoses to the coolant reservoir. 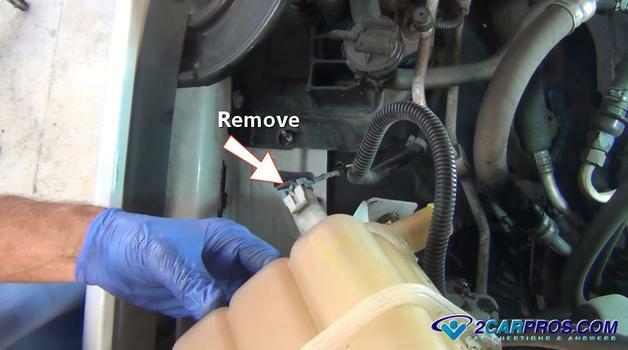 You will need to open the hose clamp by using a clamp tool or a pair of pliers. Position the clamp so it is in the middle of the fitting. This will help the hose seal against the fitting and the hose will not be forced off of when the system is under pressure. Remove the reservoir cap and refill the cooling system. 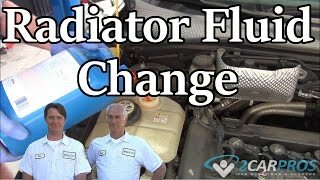 Once the reservoir is full start the engine and allow it to warm up until the thermostat opens and the coolant can fully circulate. Recheck the coolant level and add as needed until it reaches the "full when hot" line on the side of the container. Reinstall the cap and recheck the job for leaks and you are all set. Check out the video just below this image for a more visual version of this job. Here is the job being done. 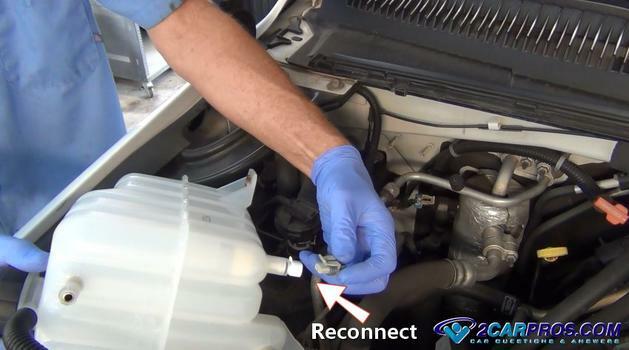 If you have any questions about coolant reservoirs, please visit our forum. If you need car repair advice, please ask our community of mechanics who are happy to help. Our service is always 100% free.